Included: One ready-to-use flightless fruit fly culture (30-50 flies included) in a self-contained 32 oz rearing container (no maintenance required), as well as all materials needed for making a second culture should you need one. Two for the price of one!. Also included is full instructions and information about these flies, and instructions for creating your second culture. Drosophila melanogaster are a tiny, winged, but flightless fly. This is due to genetically impaired wing muscles, and makes them far easier to manage that their wild bretheren inhabiting your fruit bowl. The life cycle of a fruit fly lasts from 25-30 days. Fruit flies are usually bought in conjunction with a praying mantis ootheca - when the baby mantis are born, they need a food source that is very small, and at around 2 mm long, fruit flies are the perfect choice. Your baby mantis will eat flies for around one month very happily, before you need to move on to a larger food source. 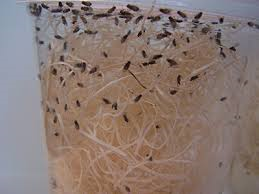 Fruit flies are also a popular choice if you are keeping poison dart frogs, small geckos such as day geckos, anoles, hatchling chameleons, and certain top feeding fish species. Replacement only: no refunds. We unfortunately cannot guarantee the well-being of the animals past shipping: once they are in your hands, you must be prepared to care for them. Remember: you are dealing with living animals. Flies fall under our "arrive alive" policy regarding shipping, so please inform us immediately if something has gone wrong with your order during shipping. Following that, please make sure you are prepared for the responsibility of caring for these animals. Simple instructions will be included with your order, which can be supplemented with research of your own. SHIPPING: Please review your invoice carefully to ensure there are no mistakes in the information we have been given for you. Ensure your order has been translated correctly. Butterfly Wings N' Wishes is not responsible for shipment delay or failure due to incorrect information on the invoice. If an order is delivered to an incorrect location or is returned to us due to these issues, we may charge an adjustment fee in event that your parcel's delivery must be corrected. LIVING SCIENCE KITS: Bees, fruit flies, isopods, worms, and other living science kits are a one-time purchase and are not typically guaranteed. Once the kits are delivered they are the responsibility of the client for their husbandry, feeding and care, although if you do experience a loss you cannot explain, be sure to contact us to explore some solutions. We want the best for our animals and are anxious to do all we can to help them thrive. In the event that you are no longer happy with your animals, please contact us to find a solution. Under noconditions should any of these animals be released in the event that you no longer want them. By agreeing to do business with us you hereby agree to abide by all terms and conditions as presented by Butterfly Wings N' Wishes Ltd.